Classic I Heart style button badge. This one is for all the plant-based Vegans and it reads, I Love Vegans. Simple and bold in its message. 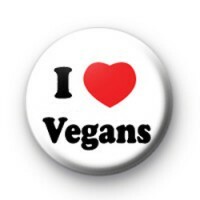 Veganism is growing in popularity and whether you are a health Vegan, love animals or are trying it out for Veganuary this is a great button badge to pin to your coat, especially if you are looking to engage with fellow Vegans. We think our badges are a great way to start conversations about topics that are close to your heart & about subjects and causes you are passionate about. They might be small but they can have a big impact.